The use of green and eco-friendly cleaning products are becoming very popular. There are so many to choose from with a variety of uses for different environments and applications. Home, office and vehicle cleaning are probably where most of the environmentally friendly products are being used. Many people are only interested in using these products and some are not really bothered as to what kind of chemicals they use to clean with. With that said, this should not really be overlooked because of the health benefits the use of eco-friendly cleaning products offer. Think of it as protecting your health, the health of those around you and the environment. The use of regular cleaning products can often contain harmful ingredients and over time can cause health issues in humans such as respiratory problems and skin irritation after prolonged use. Some chemicals require the use of gloves, which can only mean that these chemicals can cause damage to your skin. If you are using harmful chemicals, always be sure to follow the manufacturer’s safety guidelines. The use of eco-friendly cleaning chemicals are much safer for the environment because they do not contain any harmful or toxic ingredients like regular cleaning chemicals do. Because eco-friendly cleaners contain no harmful products, it makes it safe to dispose of and can also reduce water, air and soil pollution. 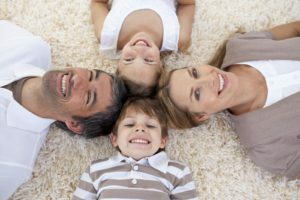 In the home, your children and pets are exposed to the use of cleaning chemicals, when using regular cleaning chemicals, often surfaces are left with residue that can cause irritation or respiratory problems. The use of eco-friendly cleaning products greatly reduces the risk of this exposure because they do not contain harmful ingredients. 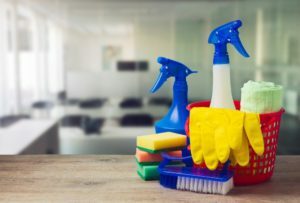 We agree that sometimes these products can cost a bit more than the regular cleaning chemicals do, but if we think of the benefits that come with it such as protecting the environment and your health we think it’s the best choice. As professionals in the cleaning business, talk to us about what we can offer as Eco-friendly solutions for your office environment.